La vivienda se sitúa en la carretera a Tejina, en la zona denominada Pozo Cabildo, con tráfico denso y referencias topográficas cercanas (Mesa Mota) o lejanas (el Teide) como únicas pistas relevantes. Ante la planicie del paisaje, la ausencia de referentes, la humedad de La Laguna, la proximidad de la carretera y la orografía, tratamos de disponer una topografía propia, de modo que el volumen resultante, volcado hacia el interior, permitiera lograr intimidad al mismo tiempo que dirigir puntualmente las vistas a las montañas y al sol del atardecer. Así, la piedra basáltica forra un volumen compacto y su cubierta a 3 aguas se cubre de tierra y plantas tapizantes de colores: la cubierta es una parte del jardín. La planta se organiza mediante un patio de acceso (inclinado hacia el sol del ocaso), al que se vuelcan la piscina cubierta y la cocina. Mediante una galería se accede al interior atravesando este patio (ajardinado a un nivel inferior) por la cara sur. El interior se plantea como un amplio espacio, flexible mediante puertas plegables y correderas que sirve como vestíbulo, salón, comedor y área de estudio. Un brazo orientado al este cuenta con baño, vestidor y dormitorio principal. Los materiales aluden al paisaje y al clima (los gruesos muros de piedra, el suelo radiante, la cubierta ajardinada, las ventilaciones cruzadas y el ajardinamiento dotan a la vivienda del equilibrio térmico deseado). Se trata de que crezcan con la casa apreciándose el paso del tiempo. Así, son protagonistas el hormigón, la piedra basáltica y la madera. Un naranjo en el centro del patio de entrada da la bienvenida con su toque de color y su aroma de azahar. Por otra parte, se tiene muy en cuenta el recorrido solar y las horas de máximo soleamiento, abriendo huecos amplios al este, sur y oeste, permitiendo así la entrada de luz natural y el calor del sol en el vestíbulo, la escalera y los baños. The house is located on the road to Tejina, in an area called Pozo Cabildo, with heavy traffic and close topographic references as (Mesa Mota) or further ones as (el Teide) as unique relevant points. In front of the plain scenery, the absence of references, the humidity of La Laguna, the proximity of the road and the orography, we try to count on an own topography, so that the resulting volume, focused on the interior, allows to get intimacy at the same time as to provide with sights to the mountains and the setting sun. 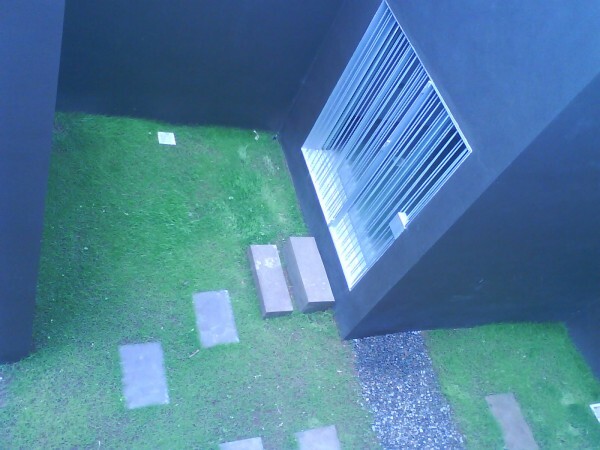 In this way, the basalt stone covers a compact volume and its gabble roof is covered by soil and a carpet of plants: the roof is a part of the garden. The plants are organized through an access courtyard (tilted to the setting sun) towards which the indoor swimming pool and kitchen are pointed. Through a corridor people can go into the interior through this courtyard (plant-lined at an inferior level) from the south side. The interior is planned as a roomy space, flexible by means of folding and sliding doors that can be used as hall, sitting-room, dining-room and also study room. A wing facing east has got bathroom, dressing room and bedroom. 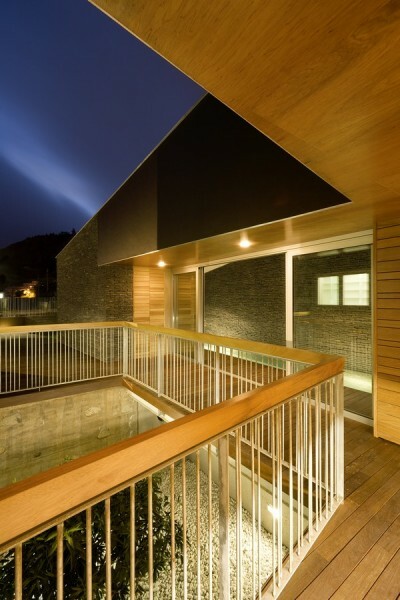 Materials refer to scenery and climate (thick stone walls, underfloor heating, gardened roof deck, crossed ventilation and gardens provide the house with a suitable thermal balance. They are intended to grow up with the house to appreciate the passage of time. 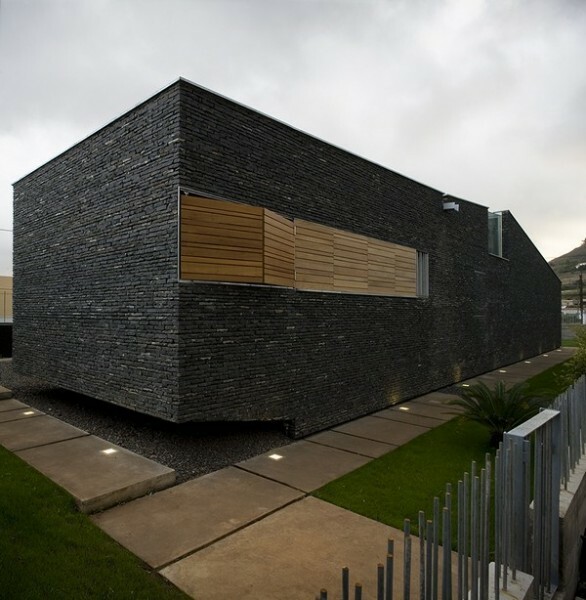 So, materials as concrete, basalt stone and wood are the real protagonists. An orange tree in the middle of the courtyard welcomes you with its colour and orange blossom. On the other hand, it has been taken into account the course of the sun and the time of maximum sun exposure, opening wide holes to the east, south and west and thus, letting in the hall, stairs and bathrooms the natural light and the heat of the sun. Дом располагается на дороге Техина, в так называемой зоне Посо Кабильдо с интенсивным дорожным движением. Автотрассы соединяют его с другими населенными пунктами (ближайший – Меса Мота). Мы старались создать собственный уникальный ландшафт с учетом равнинного пейзажа и влажного климата Ла Лагуны, отсутствия соседних строений и близости шоссе. Закрытый архитектурный комплекс образует уединенное пространство с видами на горы и закат. Стены из базальтового камня визуально компактны. Трехуровневые крыши засажены декоративными растениями разных цветов, являясь, таким образом, частью сада. Центром первого этажа, на котором расположены закрытый бассейн и кухня, является входной дворик (откуда можно любоваться закатом). Мы можем попасть в южную часть помещения, пройдя через галерею мимо дворика, на нижнем уровне превращенного в сад. Внутренние помещения достаточно просторны и могут изменять свои размеры за счет складных и раздвижных дверей, поэтому могут использоваться не только как гостиная или столовая, но и как рабочая зона. В западной части находятся ванная комната, гардероб и главная спальня. Материалы органично вписываются в пейзаж и соответствуют климату (тяжелые каменные стены, блестящий пол, навес в саду, система вентиляции и сад поддерживают в доме комфортную температуру). Главные элементы декора – бетон, базальтовый камень, древесина. В центре дворика растет живописное апельсиновое дерево, благоухающее цитрусовым ароматом. В этом проекте большое значение придавалось солнечному освещению здания и его максимально возможно использованию. Через широкие открытые зоны в западной, южной и восточной сторонах естественный свет и солнечное тепло проникают в гостиную, на лестницу и ванные комнаты.